nesdev.com • View topic - Triangle rasterization substitute. Post subject: Triangle rasterization substitute. The boat was drawn using triangle rasterization so it could rotate and animate smoothly. 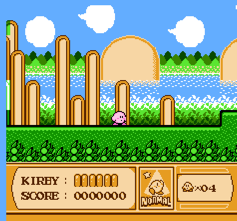 I'm wondering if people know of any good ideas to do this on the NES? 1) Lots of frames. 64 16x16 frames would fill up a whole sprite page... and that's not a lot of rotation + sail combinations. Post subject: Re: Triangle rasterization substitute. Not possible at all. On the NES, sprites can only be changed once per redraw¹. ¹ There's one game that disables rendering for five lines in the middle of the screen to upload a new set of sprites. At the very least, Solstice uses dynamic CHR RAM compositing to move the player character behind the background. I wouldn't be surprised if it's actually quite frequent among games with CHR RAM. -I think you could shear a sprite somewhat within its boxy constraints, and without breaking the cpu budget. Actually, i seem to remember tepples had a demo like that. Shearing could be used interim between coarser rotation frames. -8x16 mode can be somewhat unhelpful in a way when it comes to rotation, but in a way which shouldn't matter here. More importantly with this mode, you get access to both pattern tables for sprites. As a side, you need less sprites which can save you some cpu time. -Or you can use a mapper like cheapocabra which can flick chr-ram pages like it was chr-rom, since it has 16kB. Keep a duplicate of the background and you'll essentially get something like MMC5, except you can only use one page of sprite chr at a time. Or use as much of the total 16kB for sprites as you want and let the background have less tiles to work with. -lastly, you might be able to update chr-ram continously, but there's a limit to how many tiles you can update in one frame. I see Solstice already got mentioned. Shifting sprites in VRAM byte by byte is not trivial. This effect should be pre-rendered. CHR RAM is how I would do it. I would not consider it "hard", in fact, I think it would be a lot easier than other techniques. Is this even possible? I think you're mistaken. Sprites aren't effected by scroll. Haunted: Halloween '85 double-buffers all character animations into CHR RAM. So does my sprite shrinking demo. As FrankenGraphics alluded, if you precompute a few rotation frames for the hull and sail, you should be able to generate inbetween frames by shearing a sprite. This slides 8-pixel-wide columns of sprites or 8-pixel-tall rows of sprites to the left by 1 or 2 pixels. Battletoads uses a similar technique to draw the walker legs in level 1 and the rope in level 2. MMC3 is among these mappers. The Curse of Possum Hollow uses what amounts to TGROM with the 6264 (8Kx8 SRAM) CHR RAM replaced with a 62256 (32Kx8 SRAM). Cobra Triangle <-------- THIS ONE IS EVEN ROTATING A BOAT! Anyway, I'd go with CHR-RAM updates, copying pre-rendered frames from ROM. I'm pretty sure you have more space to work with on the NES than on the Pico8. Hmm. Ok. I've seen it on the Atari and C64. I just assumed it was possible on the NES too. So then with CHR RAM, a 16*16 pixel sprite is 64 bytes? I think I read somewhere that you have time for like 150 bytes during vblank? That seems like plenty even if I split it into layers to make more colors available. Looking over the original code again, I'm uncertain about having enough CPU time to run the vertex transforms and rasterization at 60hz. If the vertexes are precomputed, then might as well just store the scanline data in RLE chunks instead. Hmm. Yeah! I could use that in combination with palette swapping to store extra subframes since the boat outline really only needs 1 bpp. If I quantize the rotation in the original, it's still pretty playable with 32 rotation frames. If I do 16x3 frames using palette swapping + shearing that's even smoother. That leaves plenty of frames for animating the sail as well. If I can get away with putting them all in a single pattern table it would certainly make it easier. @tokumaru The CHR RAM part sounds as easy as memcpy()? (unless there are a lot of gotchas?). Transforming and rasterizing a bunch of triangles at 60hz on a CPU I haven't worked with in a looooong time sounds like I'm asking for trouble though. So then with CHR RAM, a 16*16 pixel sprite is 64 bytes? True, but pixels on the NES are also half the size in each direction of pixels on the PICO-8, and there's no hardware scaling. You might end up needing to rasterize to 32x32 at 30 fps and transfer it over the course of two frames. But fortunately, there's enough CHR RAM to double buffer every sprite. I think I read somewhere that you have time for like 150 bytes during vblank? You can safely assume that a moderately unrolled copy from a buffer in RAM to VRAM can push five sequences of 32 bytes, totaling 160 bytes. The CHR RAM part sounds as easy as memcpy()? The video memory isn't directly mapped into the CPU's memory space. Instead it's in a separate memory space like on the MSX or Master System, where the CPU has to ask the PPU nicely to write data to video memory. First write the destination address to a PPU port, then write the data to another port. For this reason, it's common to pack data into a buffer, wait for vertical blanking, and then copy that buffer. Another problem with porting the game not related to the rotation of the boat and sail is the seamless, smooth all-directional scrolling. If you want to be able to do that without border glitches, i'd recommend cheapocapra/GTROM (or some other mapper with 4 nametables: TVROM, TR1ROM) for that reason alone, just to make it easier to achieve. With four nametables, you have more than ample room to update the threadmill edges without the player ever noticing, and you won't need to get tricky while doing so. It's not the only way, but it's the easiest. Huh.. clever. Since MMC3 has controls for flicking chr-rom pages, it can do that with a chr-ram configuration, too. The size of prg-rom makes it viable. Never thought of that. This is going to be very off topic, but how does Curse of Possum Hollow use its 4 pages of 8kB? Large loads between levels? Midscreen flicking? I think MMC3 + swapping the boats in an 1kb CHR-ROM chunk + keeping all possible sails in the remainder would be easiest. With that approach, you might even get away with CNROM: 32kB of prg rom (more than enough), 64kb chr rom (meaning 8 page flips. I think you can do it in 4, 3 or even 2 page flips). CNROM is ~7-9 usd cheaper than MMC3 if you want to make cartridges. Though, you'd still need a solution for the HUD and the scrolling that is satisfactory for the OP. MMC3 could help with its irq if a bg-based status bar is acceptable. With sprites, 8x16 mode would prove cumbersome and expensive, so in that case i think 8x8 mode is preferable. Again for a bg-based status bar, GTROM virtually has 8 nametables (4 at a time), but no irq, so you need to use sprite 0, just like with CNROM. It's somewhat cheaper than CNROM, but both are what i'd consider low cost. I would definitely pre-render the ship at different angles. That's how Solar Jetman does it (it's a spaceship but the concept is the exact same), and it's a great NES game. Also with flipping you can reuse many angles, so you only have to pre-render angles between 0° and 90° and the rest is obtained by flipping existing frames. So with something like 5 or 6 angles you're done, there's really no need to do anything more complex. how does Curse of Possum Hollow use its 4 pages of 8kB? Large loads between levels? Midscreen flicking? If anyone cares, I've explained. After sleeping on it. I can only get 2 sub-frames using palette swaps. Nah, wasn't going for a 1:1 remake. I was looking for an interesting, but doable project. No need to add extra constraints. The video memory isn't directly mapped into the CPU's memory space. Right. I just meant that copying data into VRAM isn't rocket science. Just pushing bytes one at a time across a bus. Another problem with porting the game not related to the rotation of the boat and sail is the seamless, smooth all-directional scrolling. Also considering turning it into single direction scrolling with a very long map instead. I don't want to make *exactly* the same game. CNROM is ~7-9 usd cheaper than MMC3 if you want to make cartridges. Interesting to know. Not sure I'd ever want to make cartridges, but there is a store a few blocks from my house that sells homebrew games. Yeah... Dunno. Might just skip it. Alternatively, put it in a fixed world location like a physical scoreboard near the finish line. Is the sprite 0 trick hard? You get an interrupt where you change the scroll position, and do some buffering trickery to keep the HUD away from the onscreen tiles? Bwa! I totally missed that there is a sprite flip flag on my first skim through the wiki. This might be a game changer really. Along with palette swapped sub-frames, I should be able to pack a lot of sprites into a single sprite page. I kind of like the idea of sticking with the basic ROM type without bank switching as a limitation. This is *way* more help than I was expecting to get. I kinda feel bad that I can't take everybody's advice all at once. Haha.